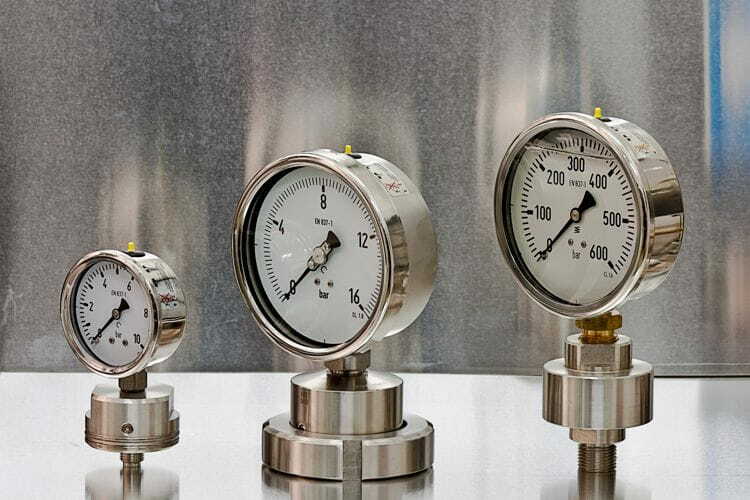 The diaphragm seals or chemical seals are intended to isolate the measuring element of pressure instruments (either a pressure gauge, pressure transmitter, pressure switch...) from some corrosive, viscous or thick process fluids, in order to avoid the damages on the instrument. The operation principle is PASCAL's principle: before assembly the instrument to seal, the measuring element of the instrument and the seal are perfectly filled with transmitter fluid. Once filled, are connected and hermetically sealed. The pressure applied on the seal by the media fluid will be fully transmitted, due to the uncompressiveness of the transmitter fluid, to the measuring element of the instrument. The compound instrument-diaphragm seal is summitted to a process where either the measuring element of the instrument as the transmission chamber of the d. seal is filled with a transmitter fluid and subsequently sealed. Then the diaphragm seal and the instrument form an indivisible unit due to the transmission fluid. Therefore it is not permitted to dismount this equipment. Otherwise liquid leak may cause damages on diaphragm and out of operation. Due to many influencing parameters, the accuracy of the instrument may be affected after assembling the diaphragm seal. ±0,5% of its value will be added on the accuracy of the instrument when directly mounted on diaphragm seal, and ±1,0% of its value when mounted with capillary extension. - Service pressure and maximum. work pressure, in order to choose the seal type, gaskets and sealing rings, surface of the diaphragm, etc. - Environment and service temperature: all temperature variation of environment or media fluid may cause lecture variations. Therefore before ordering it is very important this variable in order to choose the right filling fluid, as well as installing a cooling tower or capillary tube if necessary (recommended for temperature service above 90°C). - Media fluid: Gaseous, liquid, highly viscous, corrosive, with suspended pollution, inhomogeneous etc. Depending on its chemical composition and corrosiveness index we will choose the most suitable material (stainless steel, PVC, PP, PTFE...). - Process connection: Threaded (BSP or NPT, DIN or ANSI flanged, clamp flanged, according sanitary treads DIN11851, etc.